You don’t need an excuse to treat the lady you call mum, but Mothering Sunday (March 18th) is the perfect opportunity to show just how much you appreciate her. Visiting your mother with a gift or present is a tradition which began back in the 1600’s and garden-influenced gifts have moved on a lot since then – and for practical and indulgent 21st Century mum-friendly gift ideas, look no further than the Harrod Horticultural range. The Lowestoft-based garden supplies mail order company complement their manufactured fruit cages, garden structures and raised bed products with a selection of gifts any gardening mum would love to receive; from serious gardening tools, a traditional cuttings set and toasty welly warmers for winter and early spring rambles, the choice of presents for green-fingered mothers is both exciting and extensive. 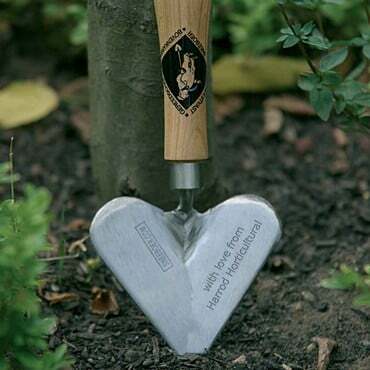 Any mum would be chuffed to receive a Sneeboer Heart Shaped Trowel but Harrod Horticultural offer the option of adding a personalised engraved message to the trowel blade, elevating a great present to extra-special status. 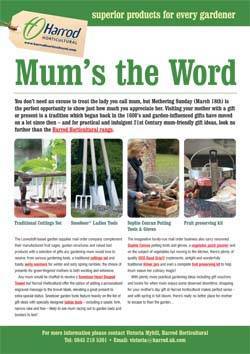 Sneeboer garden tools feature heavily on the list of gift ideas with specially designed ladies tools – including a spade, fork, narrow rake and hoe – likely to see mum racing out to garden beds and borders to test! The imaginative family-run mail order business also carry renowned Sophie Conran potting tools and gloves, a vegetable patch planner and on the subject of vegetables but moving to the kitchen, there’s plenty of quality OXO Good Grip® implements, airtight and wonderfully traditional Kilner jars and even a complete fruit preserving kit to help mum weave her culinary magic!